Kaylie Caswell went into preterm labor at 33 weeks. “We stayed in the hospital for 4 days attempting to stop labor, but we were unsuccessful,” said Kaylie. Beckett Caswell arrived on January 20th, 2017. 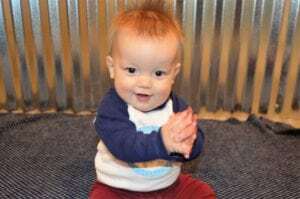 ​Today, Beckett is a happy, healthy 10-month-old who recently started crawling and is now finding a whole new world.